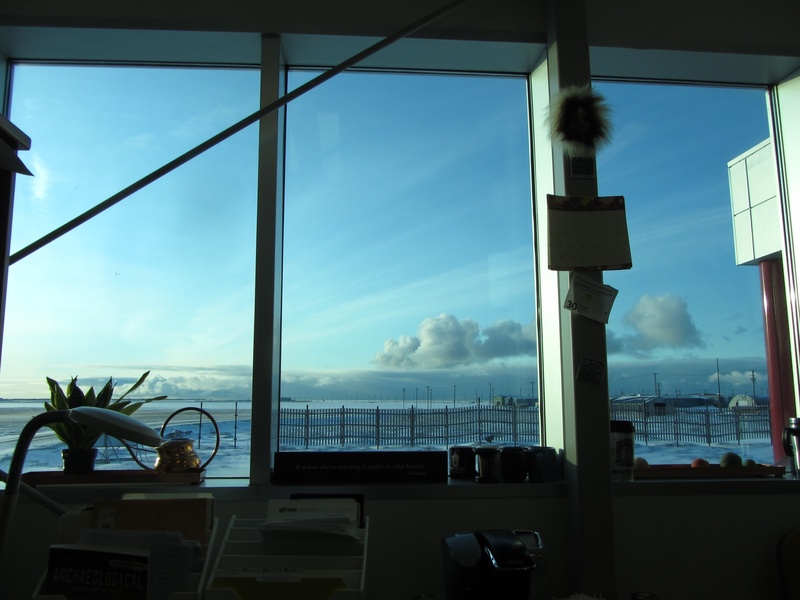 I have been really busy the last month, trying to finish several reports and papers, plan for the summer, and get ready for a research visit from Tony Krus of SUERC, who was a member of the 2008 Nuvuk field crew before he headed off to grad school. He is now Dr. Krus, and was able to get a grant to come over and work on Bayesian modeling for Barrow area dates, as well as attempting to improve the value for DeltaR (a correction factor used with radiocarbon dates on marine organisms to compensate for the excess older carbon found in the oceans). 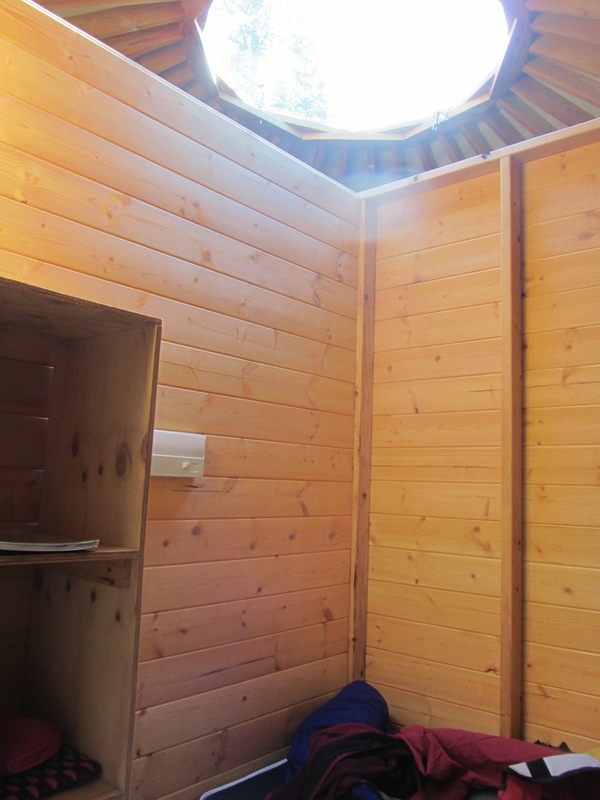 Between the massive amount of writing I was doing and smashing a finger getting luggage out of the overhead coming back from a trip, I’ve not been blogging. I hope to catch up with things a bit; there’s been considerable activity on the DONOP/global change threats to cultural and natural heritage front, as well as planning for Walakpa. I made it back from DC on Thursday night. Friday was the usual scramble after being out of town. Saturday night was the annual meeting of the Friends of the Library. There was a business meeting, and a potluck dinner. But the highlight of the meeting was the guest speaker, none other than Daniel Inulak Lum, author of the book Nuvuk, the Northernmost: Altered Land, Altered Lives in Barrow, Alaska. Dan’s family is Nuvukmiut (that’s how it is spelled in Nuvuk dialect–it would be Nuvugmiut in Barrow dialect), originally from Nuvuk. 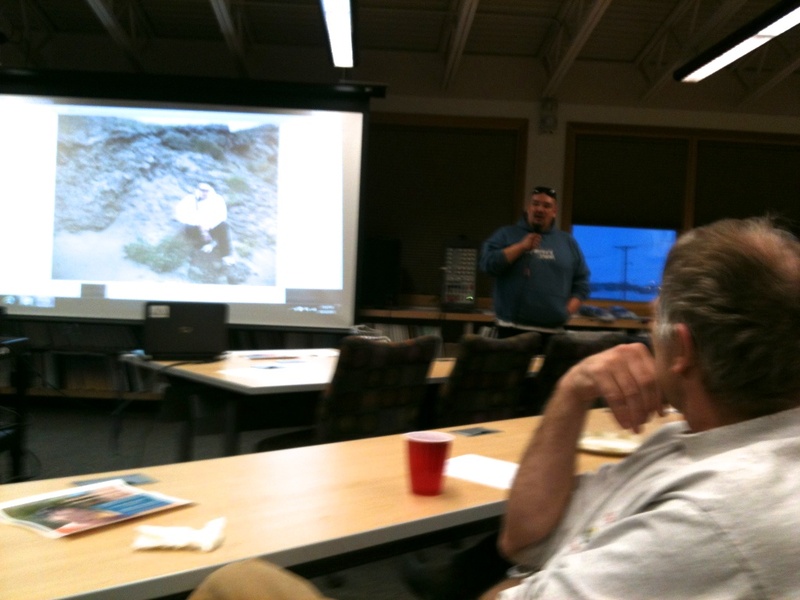 He ran a tour company which took tourists to Nuvuk for much of the time the Nuvuk Archaeological Project was active. While doing that, he wound up taking a whole lot of pictures. He has some really great animal photos, particularly of bears, as well as some really beautiful landscapes shots. 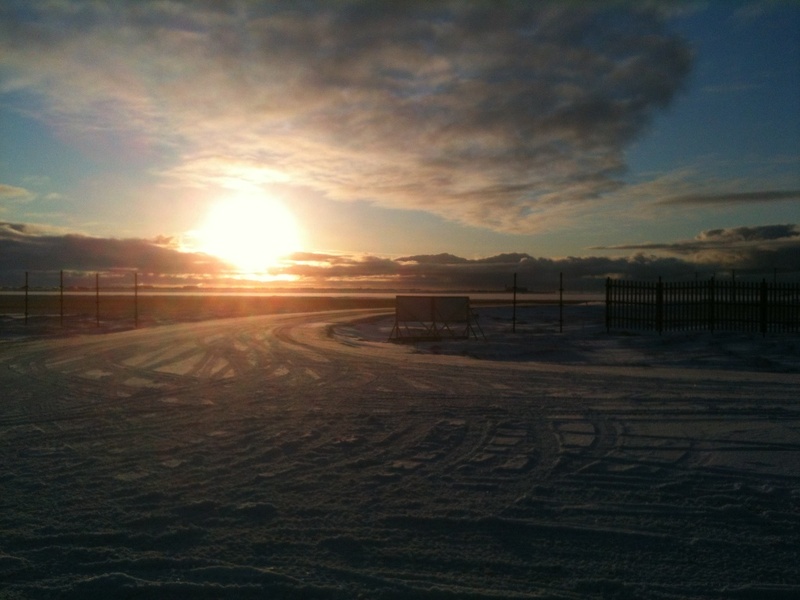 His family had to move to Fairbanks for a while for reasons connected to health of a family member, so he isn’t running the tour company any more, but it gave him an opportunity to look through his pictures and he wound up writing a book about Nuvuk and life in Barrow. When he was running the tour company, Dan gave great tours. He really wanted to pass on accurate information to his clients, and would stop at our excavations and talk to us, so he had the latest news. As he said in his talk, the village is no longer there (due to erosion) so all the Nuvukmiut have to remember it by is information from oral history and archaeology. He’d always check to see if it was OK to bring the tourists over (not if we were excavating human remains), and was always willing to bring things back and forth for us in his van. When the Ipiutak sled runners were uncovered, Dan stood by until we had them out of the ground around 2AM (despite having had tours all day) and then drove them very slowly back to the lab at NARL, making sure that they weren’t bounced around. It took over an hour to go the five or so miles. He also brought pop out for the crew on warm days. Dan showed slides of many of the photos from the book, and talked about how he came to write a book in the first place. 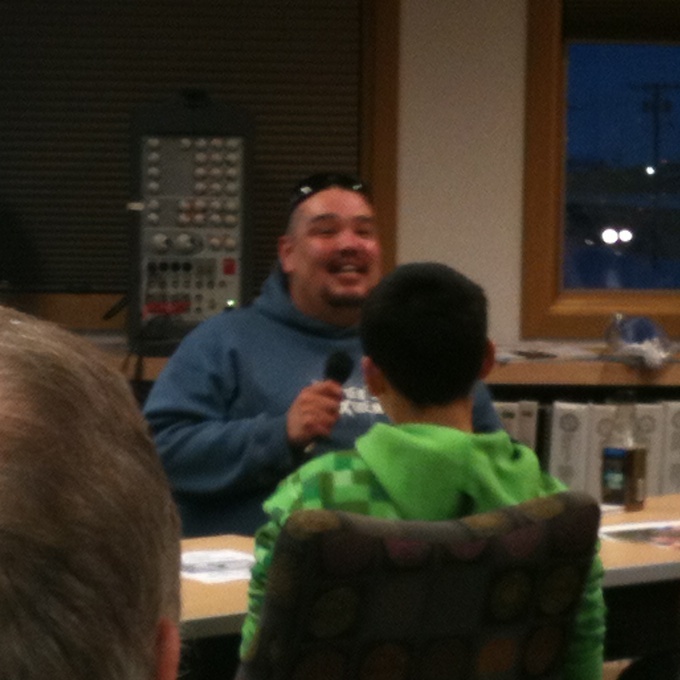 He was very encouraging to audience members about writing and publishing their own books. Dan takes questions from the audience. 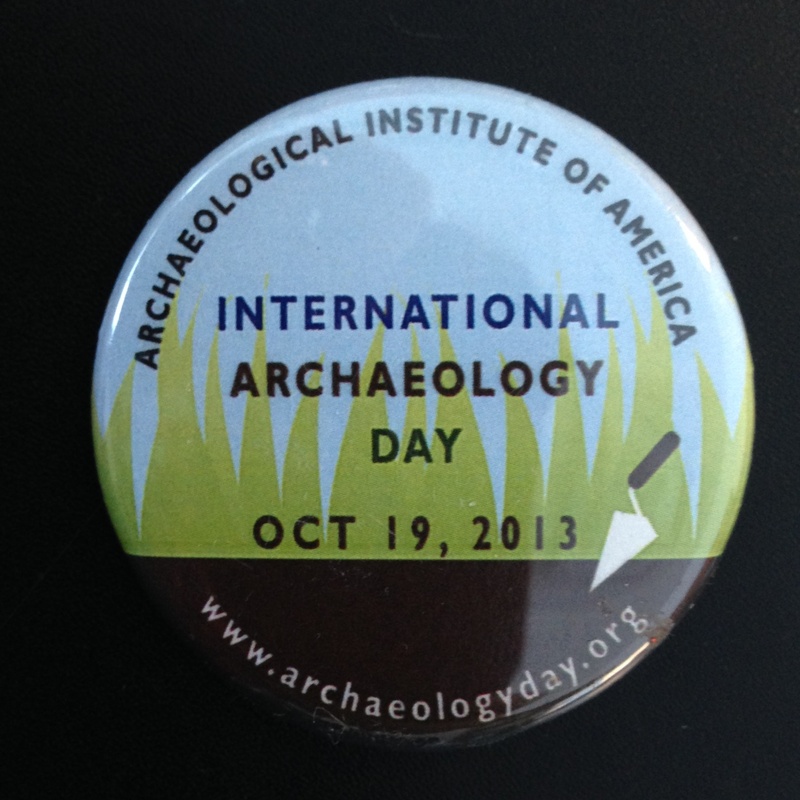 I’m going to be spending a good bit of time getting ready for International Archaeology Day, which is Saturday. We’ve added a couple of new student hire for the summer, but still have room for one or two more, so if you are interested, get in touch ASAP! With the larger crew, we have been working on getting some of the Pingusugruk collection sorted and in proper archival boxes. We need to move the container it was in, so we’d have to move the boxes anyway, and this way we can not only record which bag is in which numbered box, but also sort the “Tamis” bags, which are the 25% random sample drawn at time of excavation from the rest, to make future analysis easier, and find the rest of the bags from the column sample that Rebecca Connor & Angelique Neffe started on, so I can finish that analysis. Most of this work is being done by our adult volunteers. The students worked on this a little, mostly to get it set up so the volunteers can work easily, and also to get more room on the lab benches, so that they can work on the Nuvuk materials with no chance of things getting mixed up. 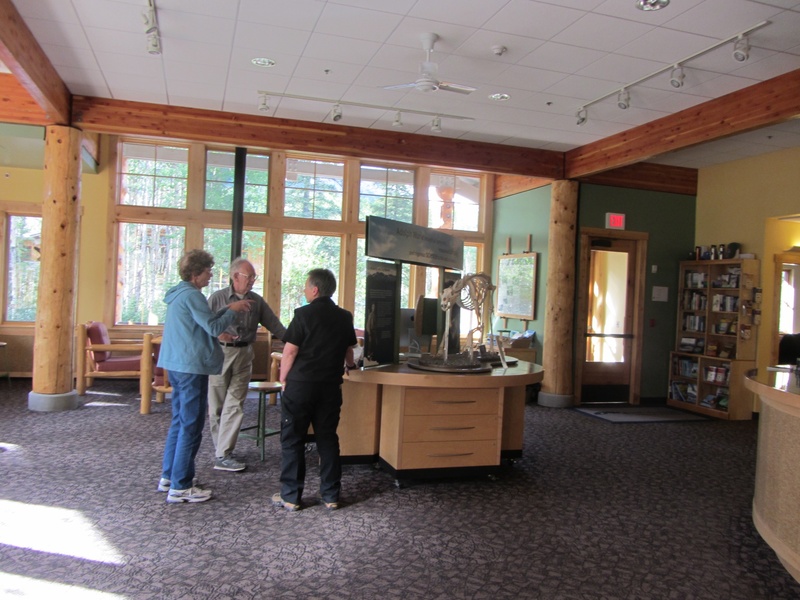 In the process, we had a number of animal bones that were collected on the beach or tundra and donated to us. 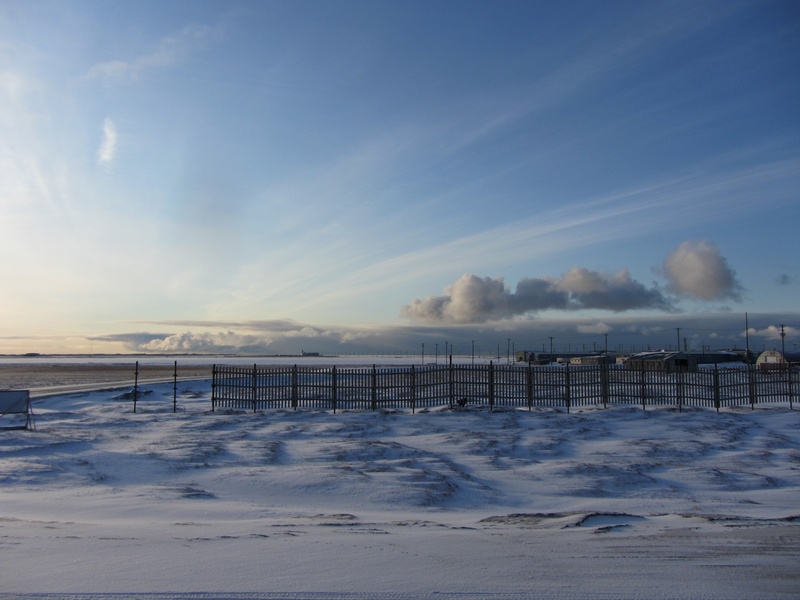 Some of them have been labeled as to species and element, and are being used to help with the preliminary sort and cataloging of the materials from Nuvuk Locus 6 midden. 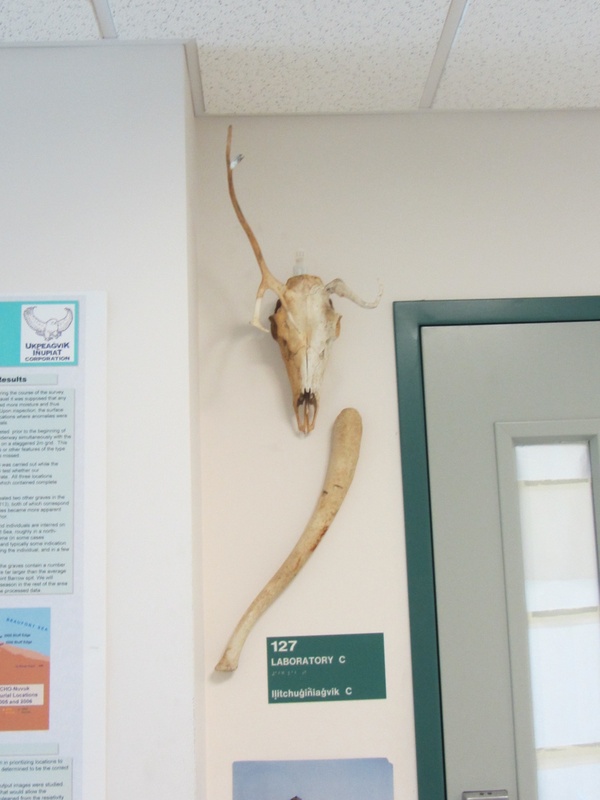 There were a few things which were sort of superfluous, like a caribou skull. 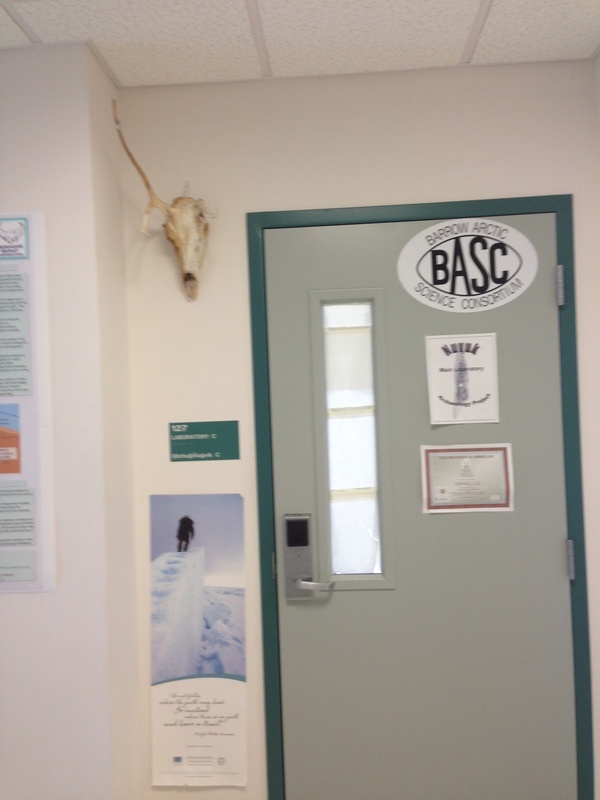 The students really wanted to use it as a decoration, so with a little glue to keep the teeth in, it was suspended outside the door (using peel-off hangers of course to avoid damaging the wall. Apparently, they found something else they felt was not necessary to include in the comparative collection, either because we haven’t found any (we haven’t) or because they figure everyone already knows what it is. The next day, this is what the door looked like. The new addition is a walrus baculum, often known as an oosik. I doubt some of the visiting scientists know what they are looking at :-). And it’s been great so far! The weather has been gorgeous, not too cold or windy. The light this morning was amazing, golden reflecting off the clouds & snow. Unfortunately no pictures from when it was best because I was trying to get stuff done before I start a series of back-to-back trips, although I did look out the window a lot when I was making phone calls. I did get some a bit later, and it is still pretty great. Looking south around 3 PM (local noon). Last year I got to finish unwrapping the child on my birthday. This year was not nearly as exciting, but then archaeology really isn’t like Indiana Jones… much. I finished and sent the quarterly report to the client on our activities supporting the ARM site. It is good to look back and see what has been done, and I’m using a format that asks for lessons learned, so it forces one to think and track, which is not a bad thing and easy to skip when things get busy. I made the final corrections on the encyclopedia entry on frozen sites, and am just waiting for one image to upload it to the publisher. The Point Hope chapter is being read (quickly, I hope) by a couple of friends, and then will get sent to the editors for review. I still need to recalibrate C14 dates for Northern Archaic and Palearctic, but that can get added to the final. One of the things I’m involved in as part of the GHEA/Long-Term Sustainability RCN is a workshop on the Kurils & Aleutian Islands. I’m a participant, not a discussant, which is a bit odd since I’ve never stepped foot in either one of them, or even worked on a collection from either area. 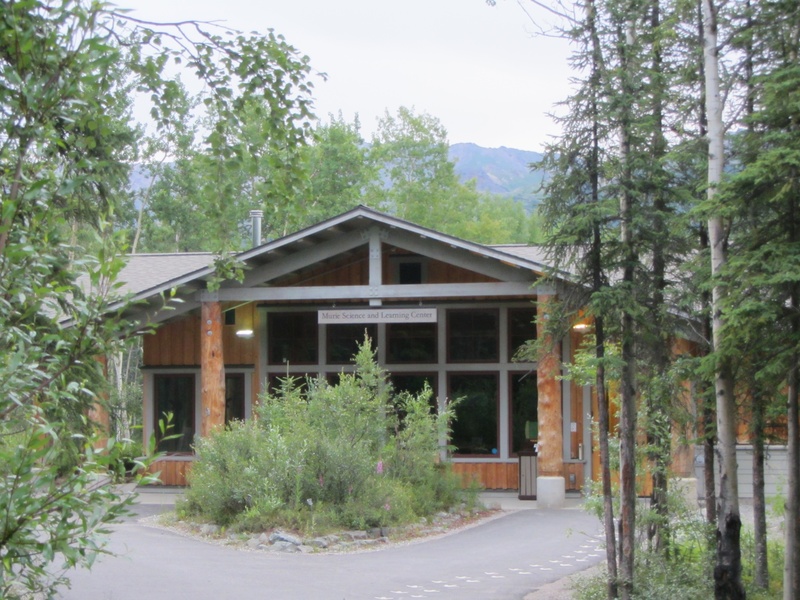 The workshop involves putting up some articles and a conference paper ahead of time, and some on-line discussion, in hopes that we will all be up to speed by the time we get to Seattle, and can hit the ground running. I got put in a group looking at Ecological Dynamics and Paleoecological Histories, which is very cool. I definitely have some catching up in the literature to do here, so I spent a chunk of the afternoon downloading the various papers & such folks in my group (and others) had put up. I have put them into my Dropbox and synced my iPad, so I can read them while traveling. It turns out I am not the only one who doesn’t have a conference paper done, and some of those that are there are not that formal :-). I also need to find a way to get a paper I wrote on bearded seals in Greenland up. I don’t have an electronic copy, but it seems pertinent. One topic that seems to be coming up is possible sea ice extension into the region and folks seem to be making a few unwarranted assumptions about how species that are not now present in the area behave. That would of course skew any climatic interpretations one might be trying to derive from faunal data. I think the bearded seal paper covers that and provides a good example of some issues that are counter-intuitive. And Barrow caught their final whale of the 2012 season! Hey hey hey Anagi Crew! 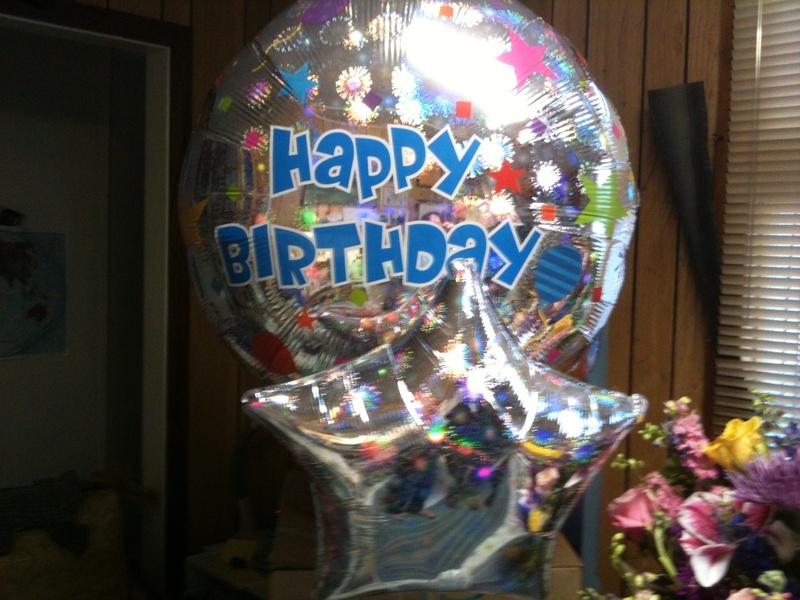 Shortly after I got home there was a know at the door & flowers & balloons arrived! That was quite the surprise, since Glenn had already bought me a huge arrangement of flowers (and a Kindle Paperwhite, which is supposedly in transit). 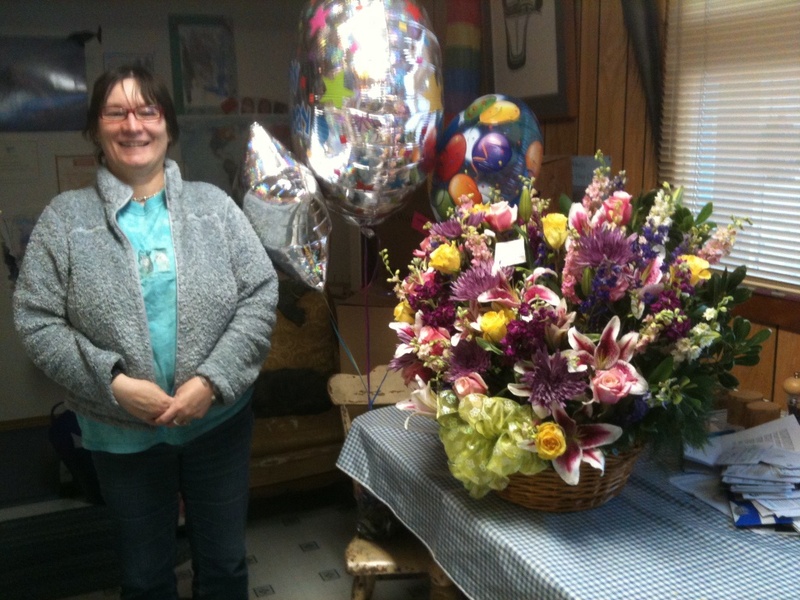 I unwrapped them, and they turned out to be from the entire staff at UICS (arranged in secret by Tammy). 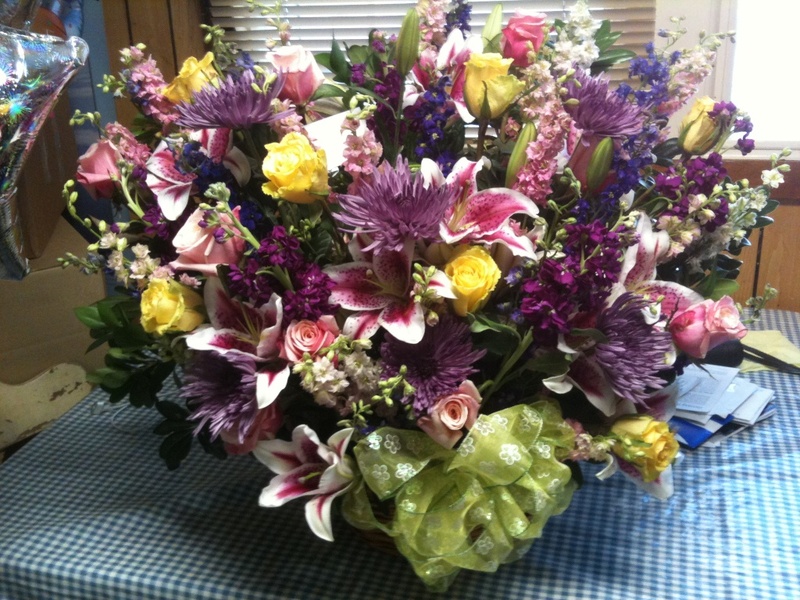 The flower arrangement is gargantuan! Flowers & Balloons, with me for scale. 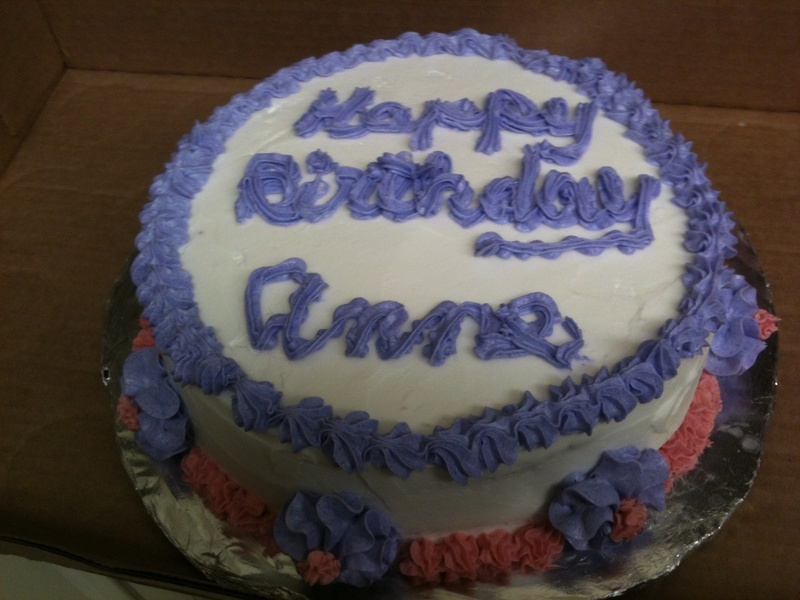 Now I am going to have cake. I’m almost done with the last of the papers I (over)committed to. I am waiting for one reference and the encyclopedia entry on frozen sites will be done. I’ve got a few more references to add and a few more C14 dates to calibrate and the chapter on North Slope archaeology for a Point Hope bioarcheology volume will be ready to go off for review. I have a general NS archeology document that I wrote and update on a regular basis that I use when people ask for background. Because the available information about the published C14 dates from some of the earlier sites is not really sufficient to calibrate them (and the archaeologists haven’t published calibrated dates) I had been using BP (before present–present being 1950) dates in this, but decided that I needed to bite the bullet and get some calibrated dates. Some more recent work has resulted in calibrated dates being available, so I can at least give date ranges for the various cultures in cal years, which should be an improvement. I started to work on the two NSF proposals that are up next. 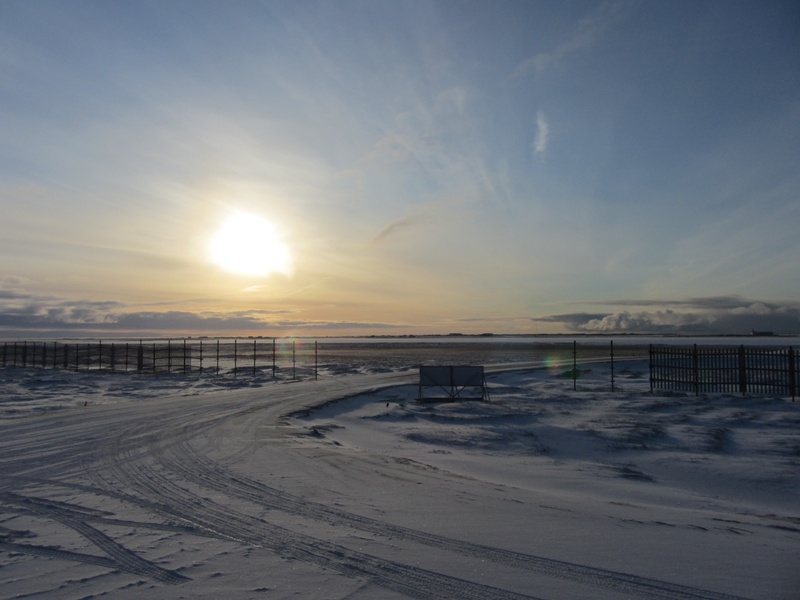 I am working on both a RAPID and a regular proposal for work on the Ipiutak component at Nuvuk. Unfortunately the NSF Fastlane web site wouldn’t let me see any of the PDFs that it converts things to. I’ll have to take this up with their tech support in the morning. On Friday afternoon we headed to Point Barrow. 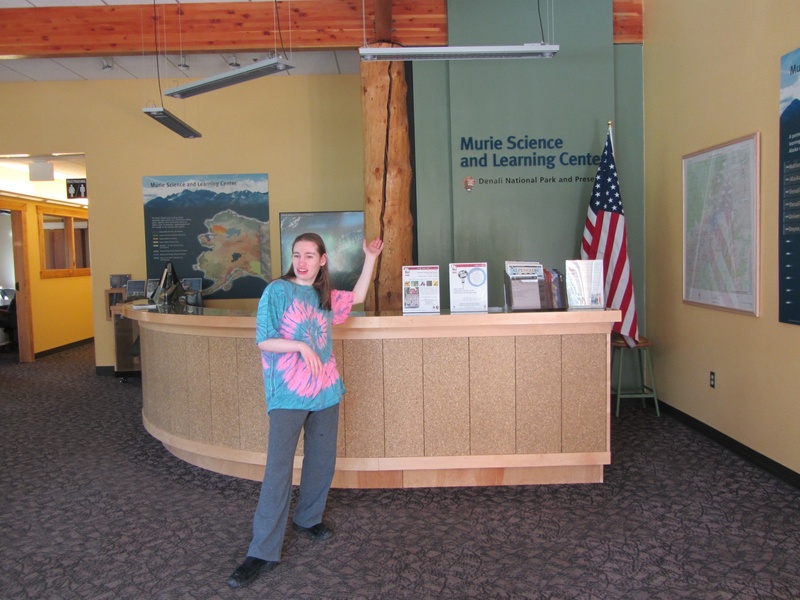 I’d gotten KTUU set up with Aarigaa Tours, who picked them up in town at Top of the World Hotel, and then picked me up at my house at NARL on the way out to the point. I’d run home from work to change into my warm gear. A good thing, too, as will become clear later. We’d been having a pretty strong blow from the NNW, and waves had actually been coming up onto the road. The road to the point had actually been closed right by Piġniq (Birnirk), because the waves had been breaking over the road and had done some significant damage. 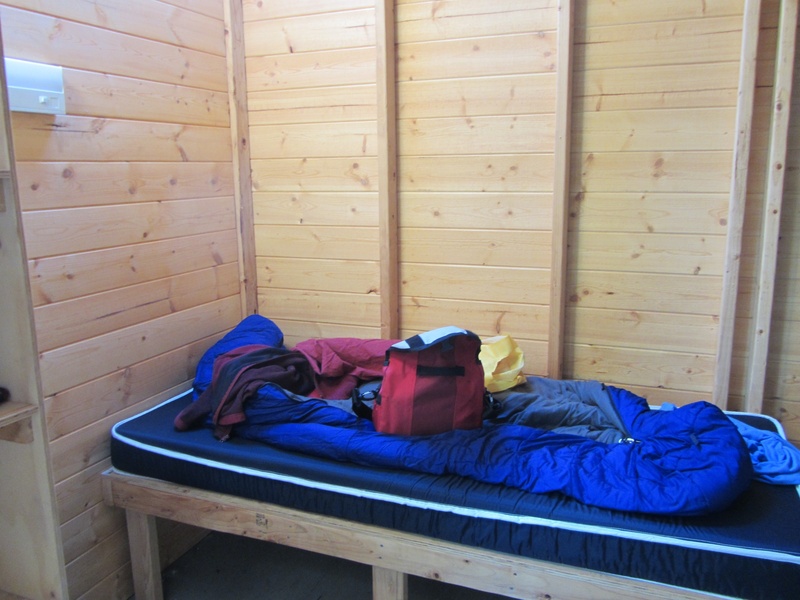 We were in a van equipped for off-road travel, so we were OK, but we had to detour through the cabin area. Once past there, the road was still in pretty good shape, but we could see water seeping in under the gravel berm. Once we got out a bit farther we could see a number of vessels & barges that had come into Elson Lagoon to anchor up and wait out the rough weather. Barges in Elson Lagoon, seen from the trail by the marked graves. Once we got to Nuvuk and got a look at the site, it was a bit depressing. However, it made a perfect example of coastal erosion in action, and made it really easy to illustrate how information about the past, which could have application to understanding what directions to take to have a sustainable future, is being lost. 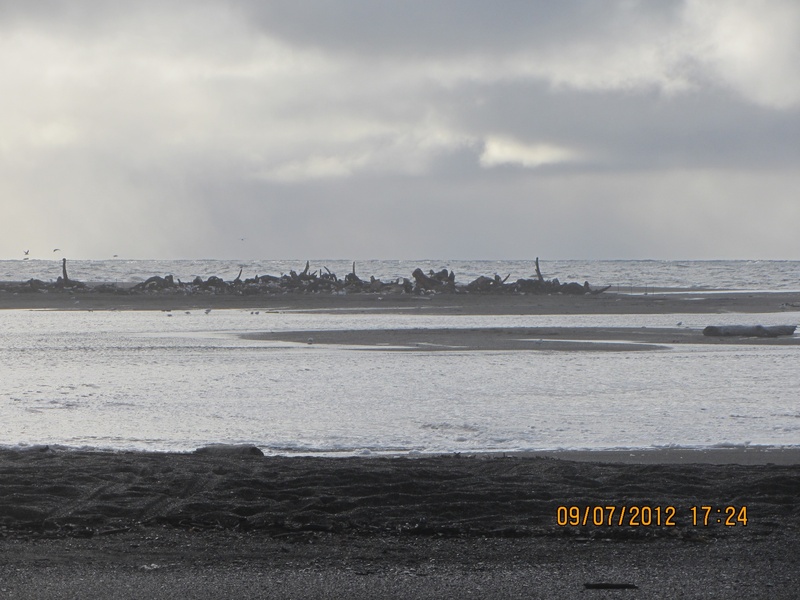 At least 10 feet (3 m) of the site had been lost to the ocean since couple weeks ago. 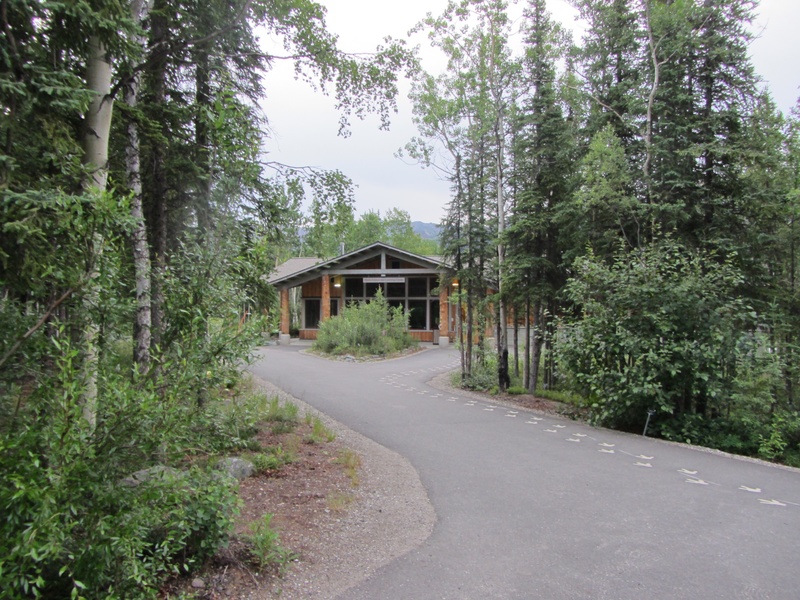 The gravel slump that had been protecting the face was gone, and thawing permafrost was sticking out and undercut. 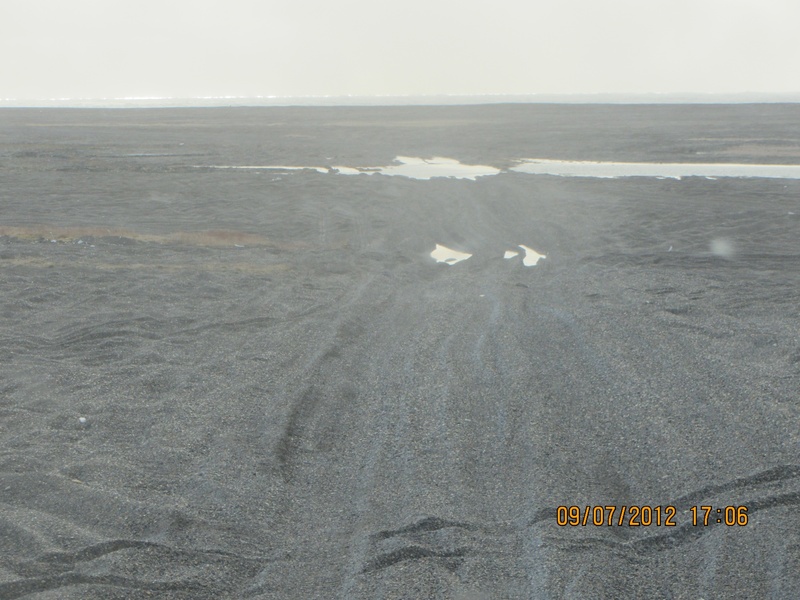 Exposed thawing Ipiutak level at Nuvuk. 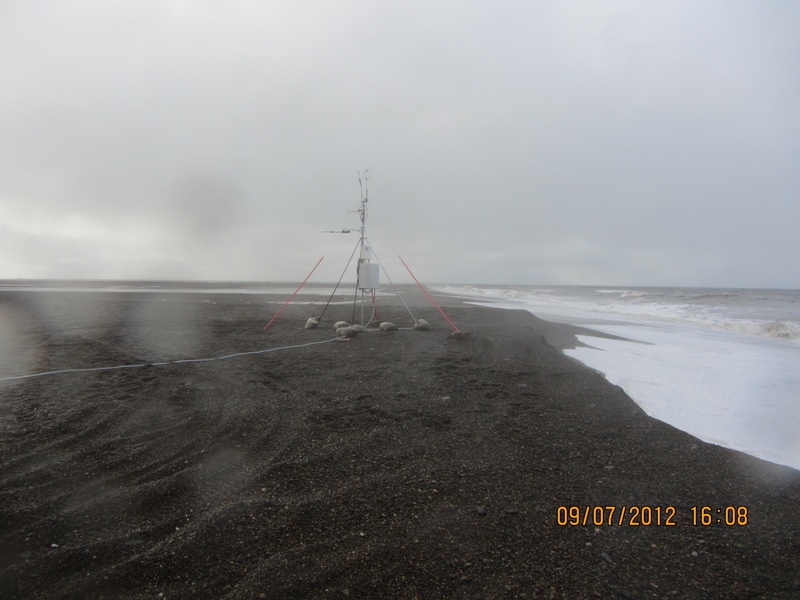 And in that permafrost was the same strandline debris that has proven to be a marker for the Ipiutak occupation. There was a large patch of what looked like fur or peat (which often seems to be found on the floors of Ipiutak structures) and an area where the wood seemed to be far more aligned and level than is normal for a strandline, but would be quite typical for an Ipiutak floor. I tried to get decent pictures, but in the end decided I needed to try to get a sample. I tried walking down on the permafrost, but it was angled, and I couldn’t get close enough without falling off. There were big waves, and the bluff was undercut. If a really big one came at the wrong time, it could wash me off my feet. Finally, I asked Ricky Bodfish, who was driving the tour van & giving the tour except for the archaeology part, if they had a rope. He did, so he dangled it down the bluff by me, we waited until right after big waves when it looked like a lull and I went down to check it out and try to get close-ups and a sample. Sampled peat in Ipiutak layer. My finger for scale. 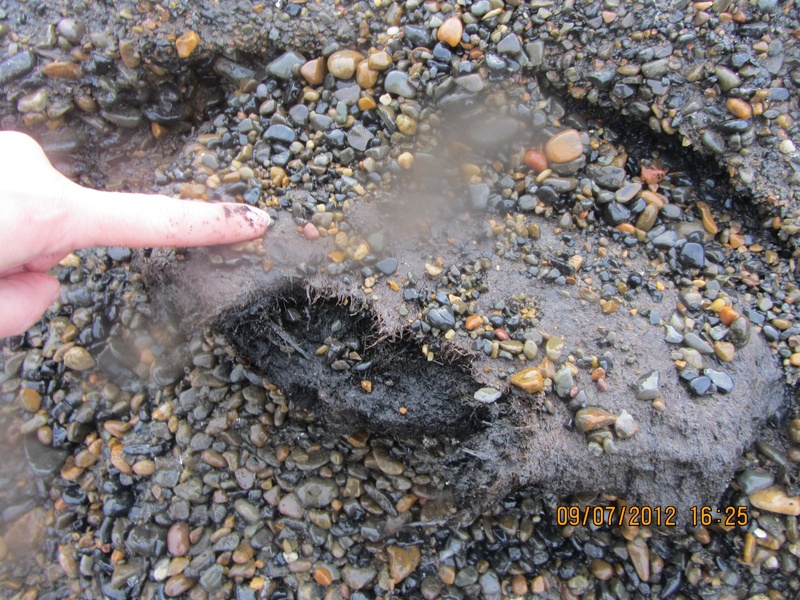 The patch of material turned out to be peat, which I was able to sample, and will send out for dating. My camera got some spray on it, but there was not way or time to clean the lens, so I just kept shooting. 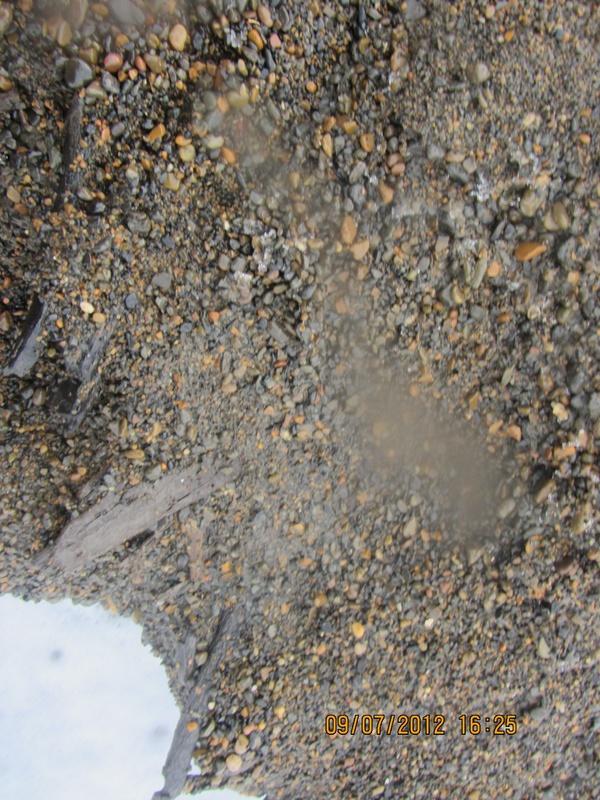 Unfortunately a pretty big wave came and dumped gravel on the surfaces just before I got a shot off of the wood, (I managed to turn so I caught it on the side where KTUU’s microphone pack wasn’t) and I could hear the next one was even louder. I ran, and made it into an area above the waves before the big one broke. Edge of eroding Ipiutak layer showing some of the aligned wood. The white is the foam on the wave that is going under this layer into the bluff. Fortunately, nothing soaked through the Carhartts so I just took them off for the rest of the trip. We had been monitoring the tower we’d put out in June, and just a few days earlier had thought it would be fine. However, the storm had taken out a lot of the bluff, and I wound up calling & texting the guys who work on the ARM project for UICS. They wound up going out later that evening and hauling the whole thing about 50 feet (15m) farther back from the edge. Just in time, since by the time they got out there, they figured it was 2-3 feet (< 1m) from the edge. Getting close to the edge. 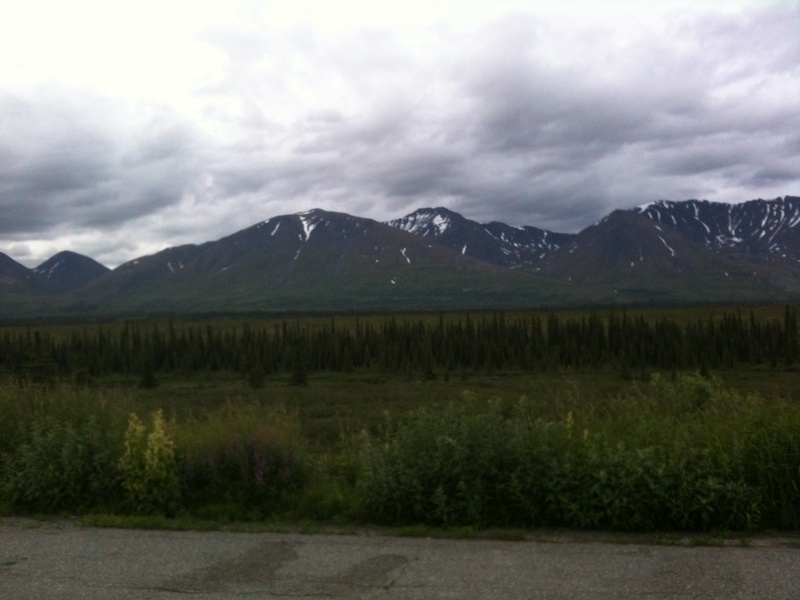 After that, the KTUU fellow wanted to see the farthest North point and go to the bone pile to see if there were any bears. We set off, and almost immediately had to detour. The trail we normally use to get to the site, which is always dry, had water all over it from the storm surge. Trail covered by storm surge. 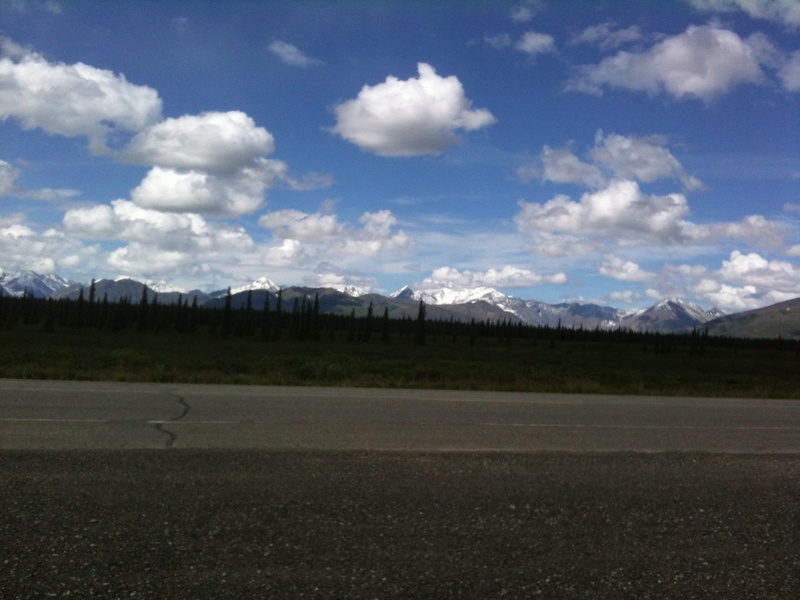 We made it to the farthest North point, which was a bit less far North than previously. 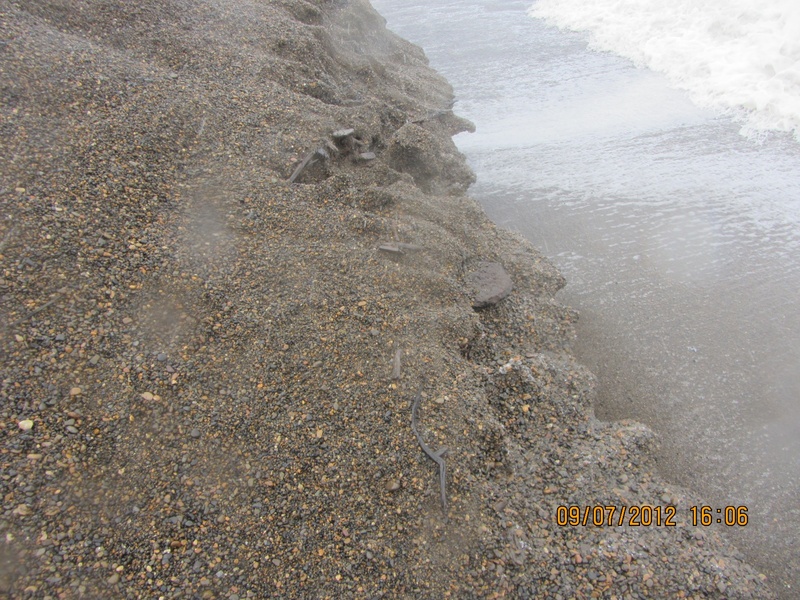 The storm surge had made it to the tip of one of the whale jawbones, and about 10 feet was missing here too. However, we did get some nice light, and the KTUU guys got busy. Dan Carpenter gets ready to shoot at the Farthest North Point. 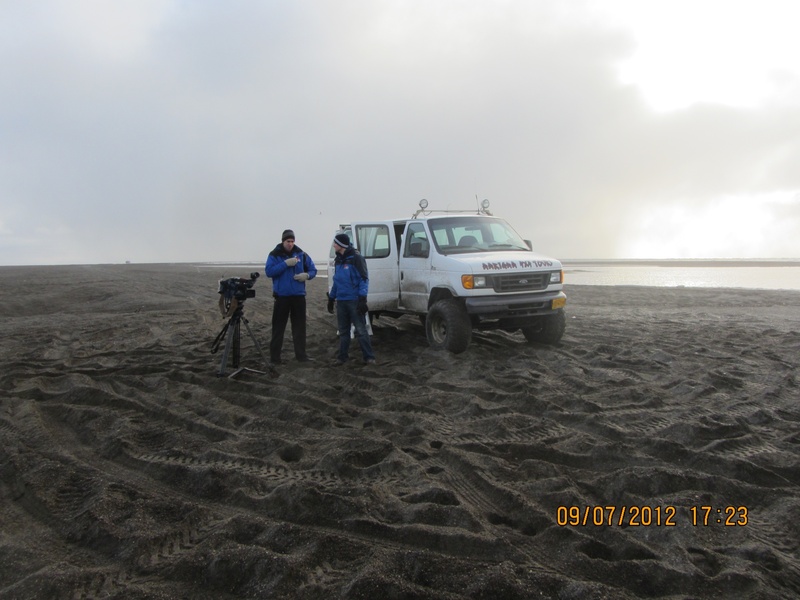 KTUU crew at Farthest North Point. Unfortunately, the trip to the bone pile did not come off. The storm surge had caused it to nearly become an island. Ricky was not sure how solid the ground was, and we did not want to get stuck there, so we gave it a miss. 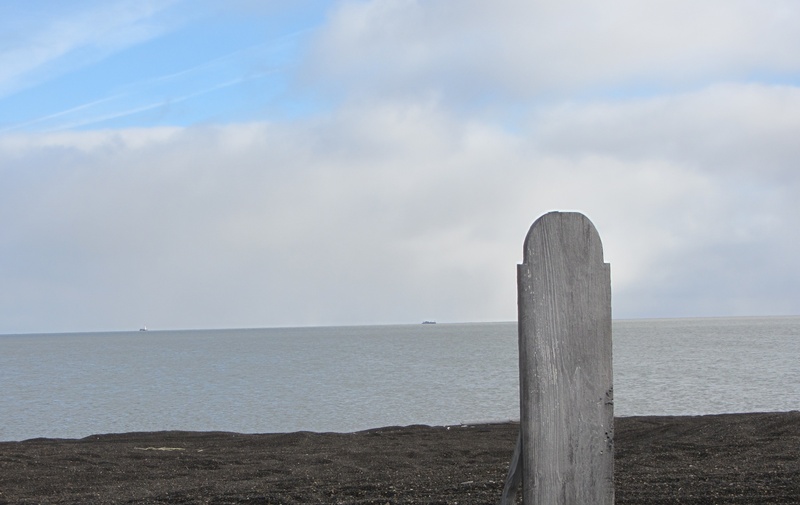 On the way back to the road, it was really clear how much of the Chukchi side of the Point Barrow spit had been eaten. 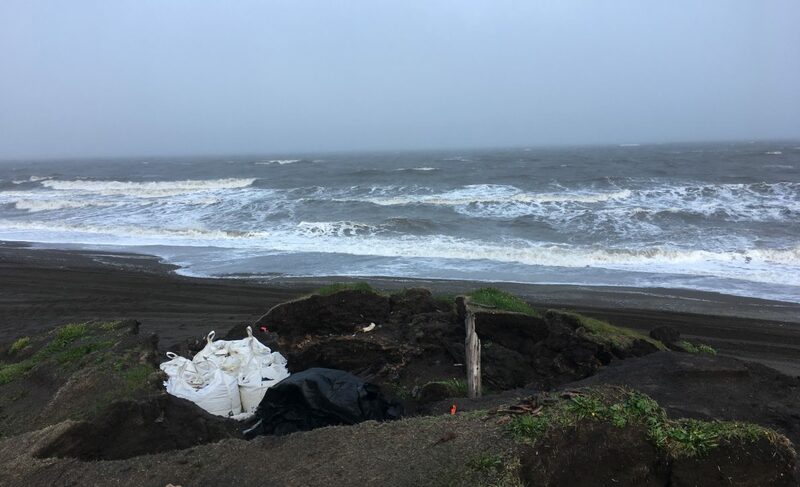 The ocean was almost up to the berm along the road, and there used to be a fairly wide strip of gravel there. Bone Pile surrounded by water. The important but not overly exciting routine of proposal preparation & writing on my part, and cataloging on Coby’s part was broken on Friday. 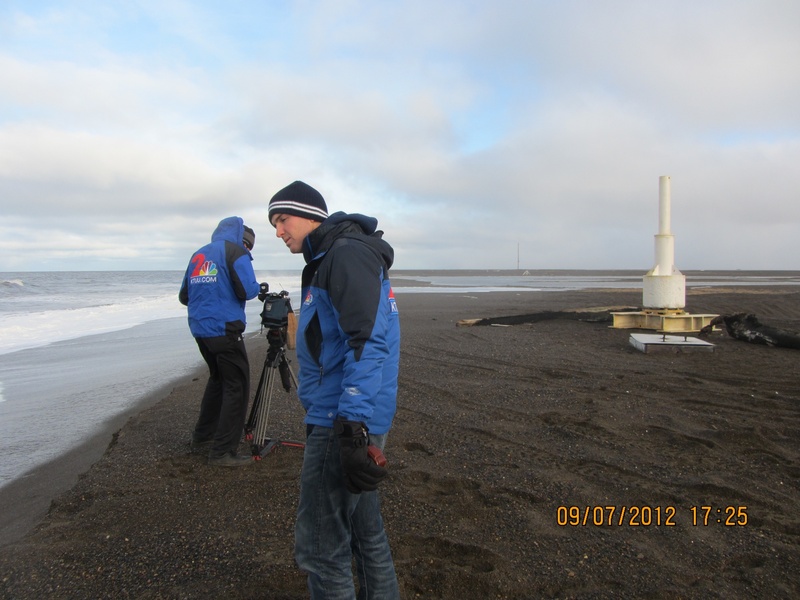 KTUU TV, the Anchorage NBS affiliate, sent a crew to Barrow for a few days. They were covering the football team, and wanted to get some practice footage, but that left them with lots of free time, so they had to get as many other stories as possible, and they decided to go for science stories. I know they did an interview with George Divoky, who had just made it in off Cooper Island (the weather has been really awful–not boating weather at all). 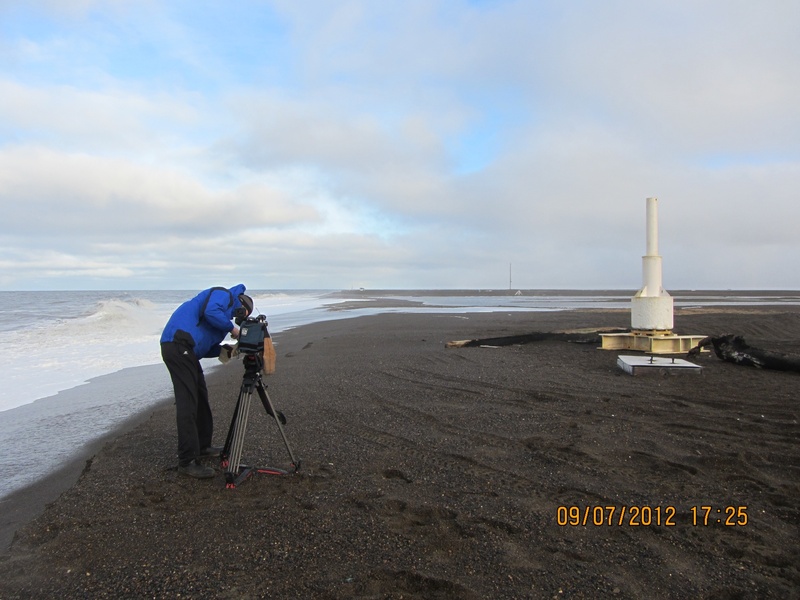 They also shot some footage about Nuvuk and coastal erosion. First they stopped into my lab for an hour or so. 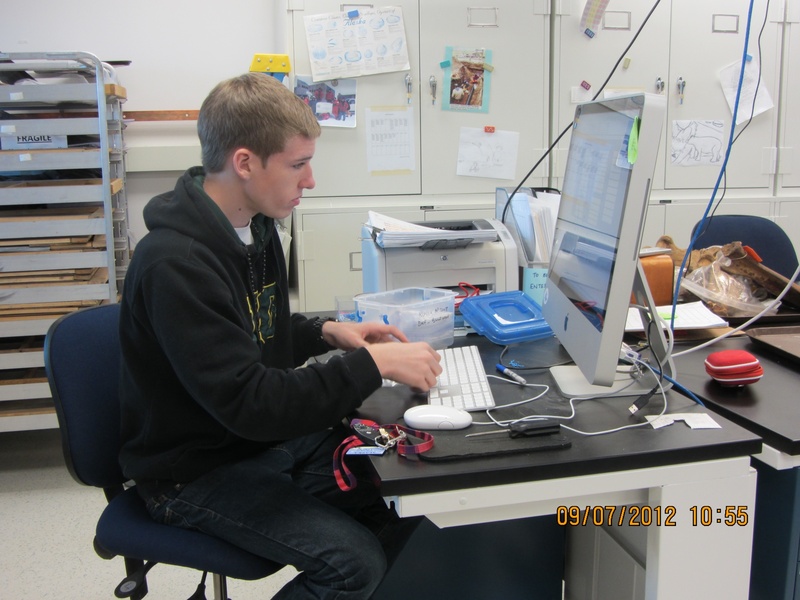 They shot a fair bit of footage of Coby Hatcher (who is going to HS on-line and therefore was working in the lab when they were there) doing various things one does in an archaeology lab, including re-bagging cataloged artifacts and entering storage locations for artifacts in the catalog database so they can be found again. With a big collection, this is pretty important, since otherwise it can be very hard to retrieve things. It actually came up because I was trying to find the bird bone from the Ipiutaq levels that had been used to make needle blanks. A number of folks think it looks like it is an albatross bone, which is interesting if true, since there aren’t many albatross around here. One of them is involved in a project which is doing ancient DNA work, and offered to run some of this bone to see if it really is albatross. There was no storage location in the catalog, so we had to look a bit. We found it and I’ll mail it out, and Coby put updates in the catalog. 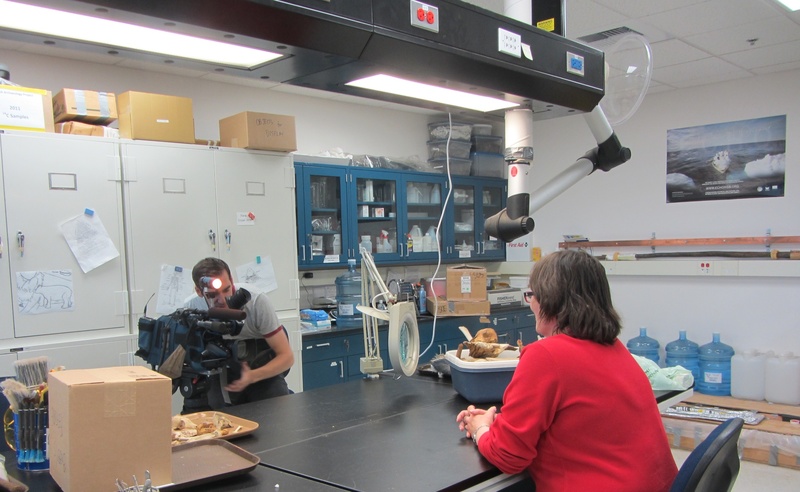 Then they shot some footage of me showing some of the artifacts, and some of me doing an interview about the project and what one can learn through archaeology. That lead into what gets lots when sites are lost to coastal erosion and/or warming and permafrost thawing. Dan Carpenter shooting video. He really liked this fox skull. 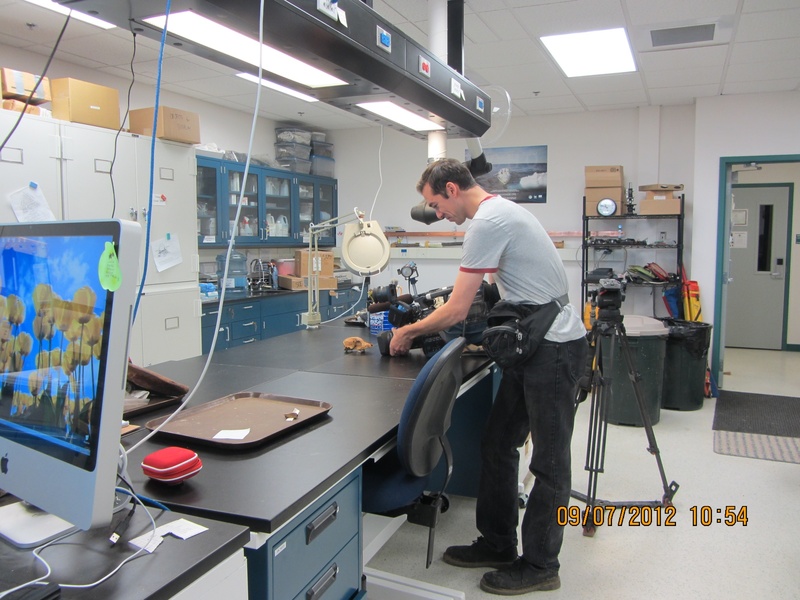 Dan Carpenter, KTUU, interviewing me in the lab. Photo by Coby Hatcher. After that, they headed off to do something else. In the late afternoon, we headed out to Point Barrow for them to get some shots of the site and, as it turned out, coastal erosion in action. That’s a story in itself, so that will be the next post.